It may be premature to say that the time for the mockumentary has passed, but it does seem that the genre is crowded with mediocre efforts (Popstar, anyone?). While the last two decades have given us some memorable films and television shows, elevating comedians like Ricky Gervais and Sacha Baron Cohen to international fame, or infamy, the format has lost some relevance in a world ruled by reality TV and, literally, by reality TV stars. What’s the appeal of a mockumentary, particularly one that pokes fun at its sad sack subjects, when you can see the surreal play out on 24 hour news channels? 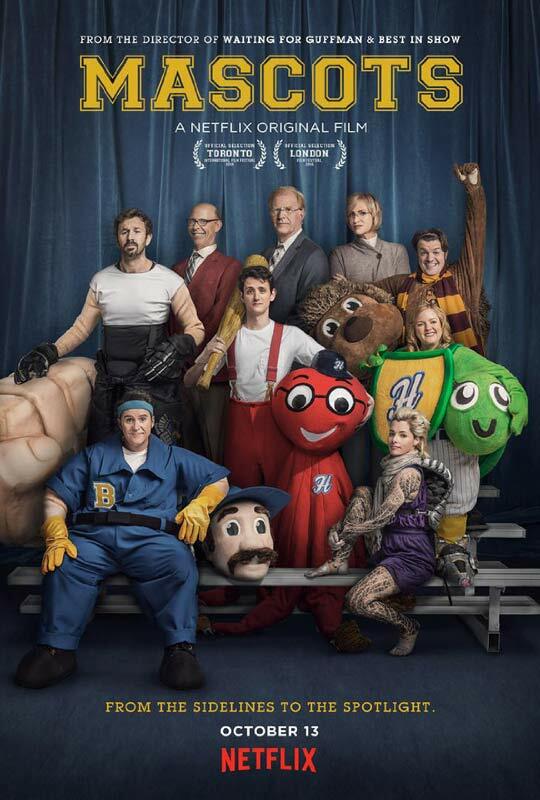 This is the world in which Mascots, the latest film from Christopher Guest, godfather of the genre, enters. Besides one sharp scene that dances around political correctness, the Netflix movie tumbles towards its finish like a pointless exercise. It has all the trademarks of a Guest film – kooky characters committed to their craft, small-time personalities with an inflated sense of importance, a best in show finale – but little of the biting humor and almost no sense of purpose. The movie is funny because the basic conceit, an amateur mascots competition, is funny, but it doesn’t try hard to push the humor beyond the goofy costumes. This parade of Guestian oddballs takes the art of mascotry Very Seriously. They comprise the twenty finalists from around the world, but mostly from the Midwest, who are competing for the World Mascot Association’s top prize, the gold Fluffy Award. Their acts are diverse even if the personalities are not. There’s the standard minor league baseball turtle and octopus duo by husband and wife Mike and Mindy Murray (Zach Woods and Sarah Baker). Meanwhile, Tommy Zucarello (Chris O’Dowd), an Irish transplant in Manitoba, prefers to work alone. Known as “the Fist” because costume is a giant fist, this “bad boy of sports mascotry” could use some time in the federal penalty box for sexual assault. In London, Owen Golly, Jr. (Tom Bennett), pronounced “Jolly”, has reluctantly taken up the role of Sid the Hedgehog from his father (Jim Piddock) who took over for his father. I’m guessing it’s a heritage thing. The cast are skilled actors and comedians who know how to bring out their characters’ eccentricities, and they are not unfunny. Parker Posey, a Guest regular, gives desperate, uncomfortable life to dancer Cindi Babineaux, who has one last shot at winning a Fluffy with her post-modern Alvin Armadillo act. Christopher Moynihan plays a more optimistic Phil Mayhew, a real estate appraiser whose real calling is to perform as Jack the Plumber for his local college football team. His act, which included a number with a dancing poop, gave me the giggles because I’m a mature woman. One of the more understated and therefore funniest performances doesn’t belong to any mascot or judge or even trainer but to Michael Hitchcock, who plays the dry, matter-of-fact president of the WMA. He hopes the success of this year’s competition will land his organization a broadcasting deal with the Gluten Free Network. He has more confidence in his performers than I do though. By the time the mascots pack it in, I wonder if the whole thing is just a minor showcase of quirk. What many Guest fans love about his films, especially Waiting for Guffman, is that they are more than the sum of their weirdos. Sure, we are laughing at the zaniness of the amateur performers in Guffman, but it’s hard to leave the film without admiring their commitment to the theater and their town. That sympathy extends to underappreciated community actors everywhere. I’m not sure you get that feeling with Mascots. Except for a few families, like the Gollys and Babineaux sisters, most of the characters don’t even make much of an impression onscreen let alone off. Posted in USA, Western movie reviews and tagged Chris O'Dowd, Christopher Guest, comedy, Parker Posey, Zach Woods on August 30, 2018 by limmer13.